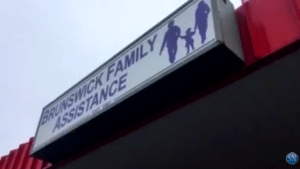 Jan 29, 2018 – LELAND — With the snip of a ribbon, the Brunswick Family Assistance (BFA) Leland office officially opened Monday morning to the loud sound of applause. 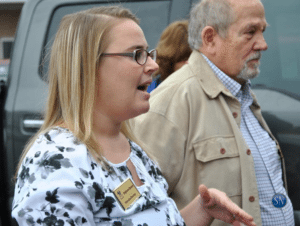 Though the nonprofit organization already operates a full-time office in Shallotte and had a part-time office in Leland, BFA Executive Director Stephanie Bowen said the organization wanted to open a full-time Leland office to make BFA’s services more accessible to people in northern Brunswick County. BFA now operates a full-time food pantry in Leland, something they weren’t able to do at the part-time office, along with financial assistance and other services. 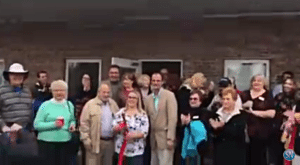 During Monday’s ribbon-cutting, attendees were able to walk through the new BFA office, which featured a welcome and waiting room, offices, a storage and overhead room, and the food pantry that already had shelves lined with food. “I think it’s going to help a lot of the people, not just from Leland itself, but from outlying areas here in the whole North Brunswick area,” she said. 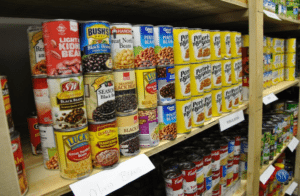 Bowen said in a former interview that the goal of the BFA food pantry is to supplement existing services in Leland provided by organizations such as Manna Ministries of Leland and First Baptist Church of Leland, which operate food pantries and distribute food on limited schedules. Though the Leland office was originally anticipated to open by the middle of 2018, Bowen said one of the main reasons BFA was able to open the Leland office in January was thanks to an additional appropriation of $15,000 made to the organization by Brunswick County last year. Time: 9 a.m. to 4:30 p.m. Mon-Thu, 9 a.m. to 3 p.m. Fri, closed daily from 12 to 1 p.m.
Beth Lewis, a BFA part-time employee who had been working at Leland’s part-time office, said now that the full-time office is open, she believes it will “relieve the pressure” a client would normally feel if they had to drive all the way to Shallotte for the food pantry.